The What: BrightSign will debut at InfoComm 2016 (booth N2247) BrightBeacon, a new technology that uses Bluetooth to bring viewer interactivity to the digital signage market. The What Else: BrightBeacon makes it possible for businesses to create unique, personalized experiences for virtually any application, enabling bi-directional communication between digital signage and customers’ mobile devices. This increases customer engagement by enabling businesses to provide highly relevant messaging and content on their digital signage and on customers’ mobile devices. A new level of audience participation is also created when the customer is presented with options to interact with and control the signage from his or her mobile device. Integrating Bluetooth technology into the digital signage ecosystem will fuel the next wave of innovation in digital signage. With an expected $40B increase in beacon-related sales in 2016, businesses are lining up to take advantage of this new technology. Retailers will increase sales with engaging point-of-purchase promotions. Informative messaging capabilities will enrich the visitor experience at transportation hubs, corporate and educational campuses, and other public spaces. Lobbies will greet visitors with a personalized welcome. And interactive exhibits at museums, entertainment venues, and other attractions will take on a whole new level of interactivity. 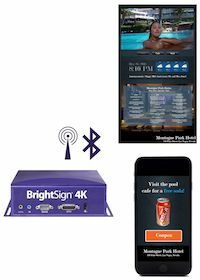 What sets BrightBeacon apart from competing solutions is that the Bluetooth low-energy (BTLE) beacon itself is integrated in the BrightSign 4K1142 player, with no need for an external device. The beacon scans for other BTLE-enabled mobile devices and sends highly targeted content based on the device’s location. Additionally, the beacon can also receive content, opening the door for two-way engagement that, until now, hasn’t been available as an integrated solution. BrightBeacon will be available in September on BrightSign’s 4K1142 media player via the free firmware update 6.2 (backward-compatible for existing 4K1142 units already in the field). BrightBeacon can be programed and controlled via BrightAuthor and the BrightSign Network, making it easy to change and update content remotely at any time. The BrightBeacon iOS app is available as a free download on the App Store, and the BrightBeacon feature can also be integrated with third-party apps. InfoComm attendees who download the BrightBeacon app and visit the BrightSign booth #N2247 will have a chance to win a daily prize giveaway of Bose headphones. Attendees simply need to text Bright to 21000 to download the app, enter their contact info, and then visit the BrightBeacon demo at BrightSign’s booth for their chance to win. Entrants need not be present to win, but winners must be able to come by the BrightSign booth to pick up their Bose headphones.